Simply put these are bar stools, but the uniqueness of them are both the seats and the legs. The seats are made from circular sections of kiln dried wood - you choose the species you are looking for and whether or not you want them stained, left natural and either wax or polyurethane finished.. The legs are black iron pipe, generally 1.25" in diameter and left as is. Now this is your preference really if you wanted them painted black or another color with a Rustoleum paint. 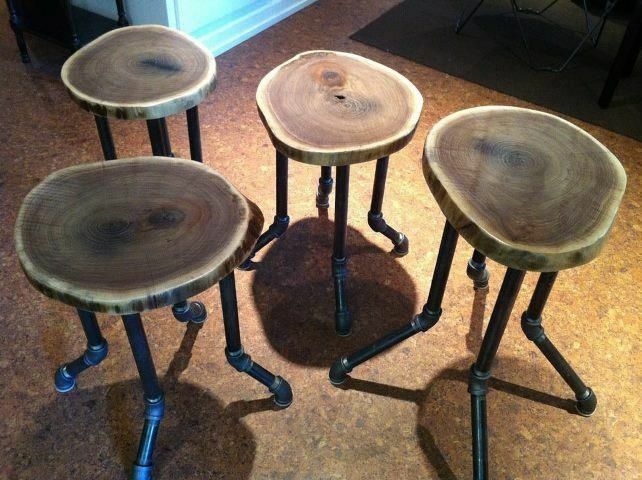 Pricing varies with wood species and quantity of stools. The nice thing is that the legs can be unscrewed from the base for shipping and then reassembled at your place.